UAMA celebrates the return of a signature painting, Audrey Flack’s monumental Marilyn (1977), after extended loan to the traveling exhibition WACK! Art and the Feminist Revolution, organized by the Museum of Contemporary Art, Los Angeles. 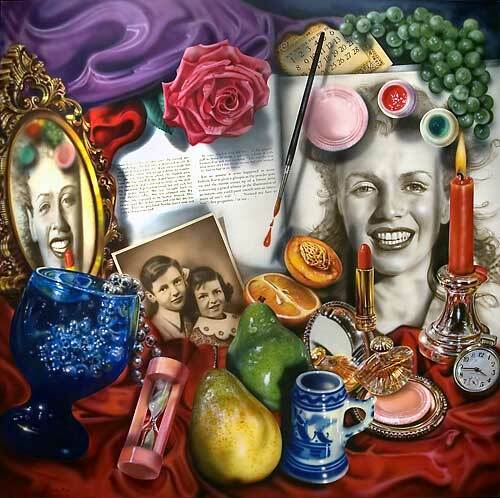 One of three monumental paintings in Audrey Flack’s Vanitas series (1976-78), Marilyn is among the most significant works of the artist’s oeuvre. Drawing from the related traditions of still life, vanitas, and trompe l’oeil, Flack’s painting endows material objects with layered symbolic meaning and expands the possibilities of these historical genres through innovations in form and content. Influenced by the work of 17th-century Dutch still life painters, Flack celebrates the lush textures and colors of the physical world with her densely packed depictions of illusionistically-rendered objects. As a vanitas (a still life that alludes to the vanity of worldly pleasures and to life’s transient nature), Marilyn serves as a commemorative meditation on the life, death and celebrity of Marilyn Monroe; it includes both conventional vanitas symbols (an hourglass, a candle) and modern ones (a photograph, a calendar). Yet, unlike traditional still lifes, Marilyn also operates as a self-portrait in which Flack associates her role as artist with the movie star’s role in creating a public persona, and in which she contemplates the passage of time in her own life through self-referential objects. In addition, Flack’s Marilyn functions within the American still life tradition, particularly that of trompe l’oeil (“trick the eye”), whereby illusionistic representations of commonplace items create three-dimensional effects. As a Photorealist, Flack also endeavors to make objects appear to be real. While the aims of Photorealism are more conceptual than perceptual, Flack’s work shares the trompe l’oeil interest in the materiality of objects and in investigating the nature of illusion, reality, and mimesis. The accompanying works from the UAMA permanent collections are intended to illustrate the still life, vanitas and trompe l’oeil traditions and to provoke suggestive connections with Marilyn. While her work is rooted in these genres and their fascination with the material world (and the ways in which they signify the non-material), Flack contemporizes them in Marilyn by enlarging the scale, by extending objects beyond the picture’s border and placing them in unexpected angles and spatial relationships, and by inserting personal references and symbols. Thursday, April 16 at 5:00 pm: Audrey Flack (Center for Creative Photography). Book signing and reception follow at UAMA. Saturday, May 2 and Saturday, May 9 from 1-4 pm: Artist Jo Valandry leads a two-day workshop on creative interpretation of objects. Fee: $20 for single session, $30 for both.